UCS has released an updated version of its Satellite Database, with launches through November 1, 2010. Space has become increasingly congested: currently, the Database shows 958 active satellites on orbit. The United States owns roughly half of these, as it has at least since 2005, when UCS started producing the Database. The number of actively operating satellites has grown by about 50 percent during each of the last two decades. In addition, the U.S. currently tracks more than 20,000 pieces of debris orbiting the Earth. Despite the development of international guidelines for slowing the accumulation of debris, the amount of large debris (greater than 10 centimeters in size) in orbit has grown by 50 percent in the past four years, primarily because of events that would not have occurred had there been full compliance with these guidelines. Half of the known collisions between objects in space have occurred since 2005. Since debris is the detritus of space operation, it is generated and stays in the orbits used by satellites. Is space contested? 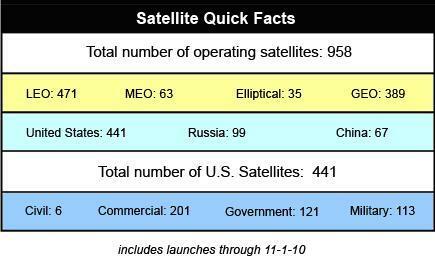 Certainly more states and corporations own satellites than ever before. According to the Database, over 50 states own satellites or a significant share in one, and new actors emerge yearly. Since 2007, Colombia, Switzerland, Turkey, Venezuela, and Vietnam have joined this no-longer-exclusive club. The slots in the highly valuable geostationary orbits continue to be oversubscribed. The number of active satellites in geostationary orbits today is the same as in 2005, though the number of active satellites in all orbits has grown by about 20%. As new space actors emerge, they may question how fair is the first-come, first-served way of obtaining these slots.